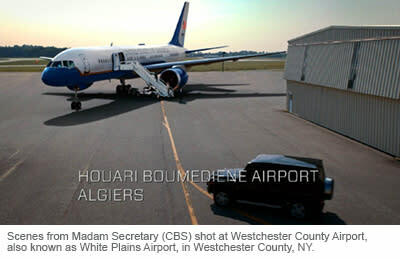 It’s Sunday night, and you’re tuned into “Madam Secretary.” Secretary of State Elizabeth McCord’s plane touches down at Houari Boumediene Airport in Algiers. Or did it? Actually, you’re seeing our very own Westchester County Airport on the screen, one of the many locations the show has used here during its three seasons. Recently, we had the opportunity to catch up with Jordan Bowes, Assistant Location Manager for “Madam Secretary,” to find out more about the show and what criteria location scouts use when making location decisions. Q: Why do you find Westchester an appealing location for “Madame Secretary”? A: JB—Our show is set not only in Washington, D.C., but also in cities across America and in many countries around the globe. While viewers might be surprised how many different cities and countries we’ve been able to recreate within the five boroughs of New York City, sometimes a script will call for a large-scale location or a location with certain geographical features that can’t be found in New York City. 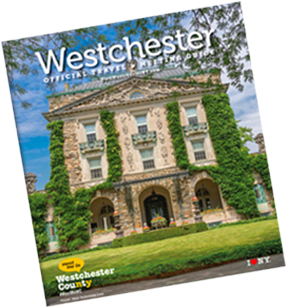 That’s where Westchester often comes in to help us bring our writers’ ideas to life. Q: What Westchester County locations have been used for Madam Secretary? Q: When you choose to shoot in Westchester, what drives the decision? A: JB—The decision to film in Westchester is driven by the same process that determines why we film at any given location, which is to find the best setting possible for each scene based upon the shared vision of our Production Designer and each episode&apos;s Director. When we pick someplace, it&apos;s based on merit. Q: How have cast and crew been received when you&apos;re shooting here? A: JB—The cast and crew have been very well received when we&apos;ve filmed in Westchester. The majority of our locations have been private spaces where we don&apos;t necessarily have much interaction with the public, but Westchester residents have thus far seemed supportive when we film in their parks, restaurants, and other businesses, and we hope that they enjoy seeing places they know on television. Q: When shooting here, do you eat in local restaurants, stay in local hotels, or hire local vendors? A: JB—It varies from shoot to shoot, to be honest. We definitely eat in local restaurants every time we film in Westchester, especially the prep/wrap crews that get our sets ready a day or two before the shooting crew arrives and strike our sets a day or two after filming is completed. Almost all of our crewmembers are residents of the tri-state area, and our stages are located in Long Island City, Queens and Greenpoint, Brooklyn, so we don&apos;t have as much of a need for hotel rooms as an out-of-town production might. That said, it does happen from time to time, and as a show that films in a lot of hotels, "Madam Secretary" is open to filming in more Westchester hotels than we have so far. Regarding vendors, the Locations Department often rents tents, tables and chairs, light towers, and air conditioner/heater units for logistical support. Q: Do you consider Westchester to be "film-friendly?" A: JB—I absolutely consider Westchester to be film-friendly! 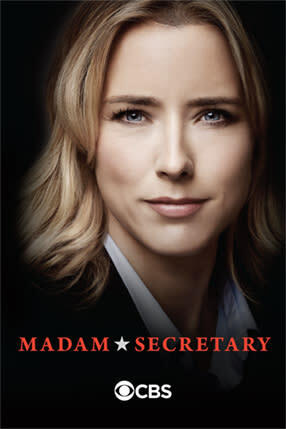 On "Madam Secretary" alone, we have had a few dozen successful film shoots made possible by people willing to work with us from logistical and administrative standpoints. It also helps that the overwhelming majority of people with whom I&apos;ve had the pleasure of working have been actually-friendly, too. Q: Is there anything you&apos;d tell fellow location scouts about Westchester that they may not know? A: JB—There are plenty of location scouts that have been in the film business longer than I have and who know Westchester better than I do, so I&apos;m not sure if I should be offering anyone advice. The only thing I&apos;d say is that if I&apos;m stuck looking for something that I just can&apos;t seem to find on my own, I&apos;ve rarely gone wrong asking a local. Even if they can&apos;t help me find exactly what I&apos;m looking for, they can usually recommend a great place to grab a cup of coffee or a bite to eat. Q: Can you give us any inside scoop about Madam Secretary or what viewers can look forward to in the new season? A: JB—As fans of the show know, we&apos;re always topical. And our writers have hit the nail on the head again this season with stories that are just now hitting the news. Tune in on Sundays for more! • Kensico Dam in Valhalla (Ep. 223).